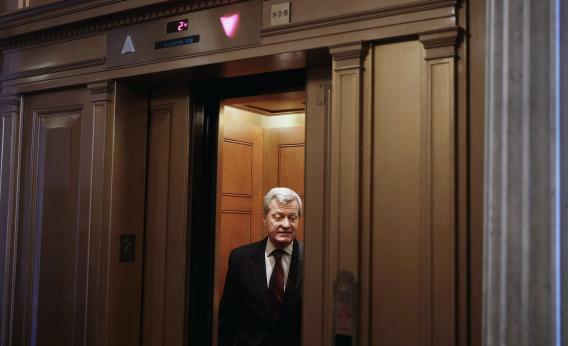 Sen. Max Baucus (D-MT) boards an elevator at the U.S. Captiol on March 22, 2013 in Washington, DC. - single-handedly populated much of K Street, though to be fair 36 years in Washington will have that effect. But Baucus leaves behind a legacy of truly inspiring scorched-earth campaigns. He had $5 million in the bank, which was spooking possible opponents even despite his so-so poll numbers. No one had forgotten how he ethered the last Republican who seemed to have a shot against him. A key Baucus staffer during that race was Jim Messina, better known now as the 2012 campaign manager for Obama-Biden.